A Marine Corps officer and a war correspondent hope to have the courage and luck to live through the horrific final year of World War II despite unimaginably savage battles and constant danger of other kinds. Historic figures such as President Franklin D. Roosevelt, Generals Douglas MacArthur and George Patton, and rocket scientist Wernher von Braun all appear in this narrative, which is told with faithful historical accuracy. 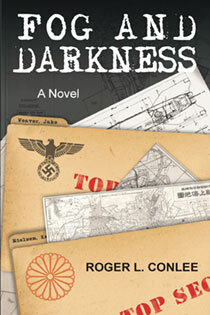 “As we are whisked through the 330 pages of Fog and Darkness, Roger Conlee’s newest offering, we learn that the heroes and headliners of World War II weren’t nearly as righteous as they were portrayed in the annals of military history and our high school textbooks.